The first time ever had this potato salad was at Ruby Tuesday's. 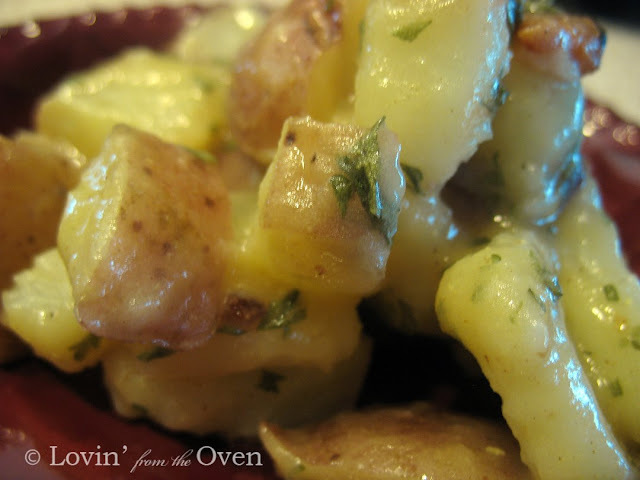 I enjoyed the light vinaigrette dressing with bits of bacon on new red potatoes. It seems like given this economy, people are cutting back on eating out and concentrating on eating "in" more....hooray! I love eating in. No noisy restaurants, waiting for the check to come, and the expense that goes with it! But, don't get me wrong, eating out is one of the few things that I enjoy doing...no messy kitchen to clean up! I found this recipe when I walked into my local Harmon's grocery store. It was in a small leaflet at the end of the checkout counter, filled with Valentine dinner ideas. I was so happy to see this recipe. It is a hot German Potato Salad, although I enjoyed it even more the second day when all the flavors were melded together and infused into the potatoes. 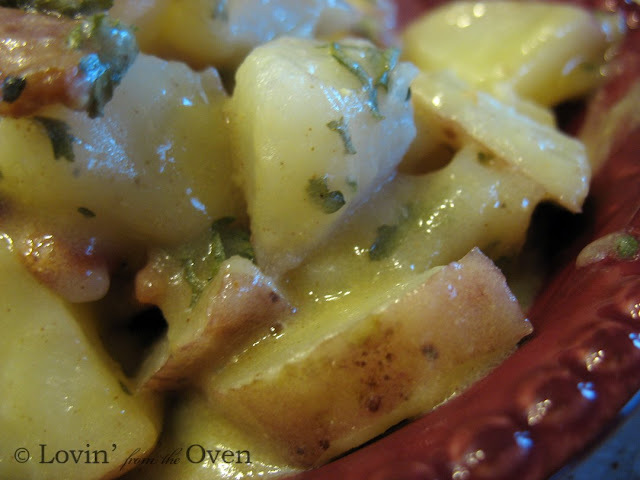 Place potatoes, celery, pepper, egg, and parsley in a large bowl. Brown the bacon in a large pan' remove and drain on paper towels. Lightly saute the onion in the bacon grease until soft. Add the flour, salt, and pepper. Stir to completely combine. Add the beer (or drink of your choice) vinegar, and sugar. Whisk until smooth over medium high heat. Whisk in the mustard and pour over the potato mixture. Fold in gently to moisten all ingredients. Can't wait to try this I never have good food that my German daughter in-law will eat maybe this will work thanks for sharing.